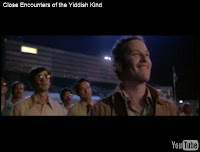 In 2007 The Los Angeles Jewish Film Festival wanted to have some fun in publicizing their annual event, so they came up with this interpretation of the classic scene in Close Encounters of the Third Kind where the aliens land and start to communicate with earthlings by using a series of musical tones. We thought it was funny and very much in the spirit of the many unusual versions of a very popular Jewish song that we have been blogging about during the past year. Here is the LAJFF version followed by the original scene from Steven Spielberg's UFO epic starring Richard Dreyfuss. We hope you'll enjoy both versions. Don't miss tomorrow's special edition of Jewish Humor Central when we celebrate our first anniversary with the ten most watched video posts of the year! In your morning email tomorrow if you are a subscriber, or visit www.jewishhumorcentral.com any time after 12:15 am.